What's not to love about a Martin Scorsese-Leonardo DiCaprio partnership? The Aviator was so good it almost hurt. The Departed was one of the greatest movies ever made. Gangs of New York...I have not seen. Shutter Island was what was to be expected from the partnership. 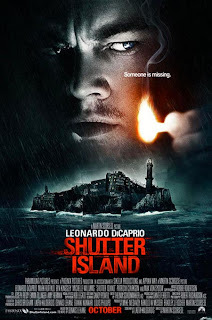 Teddy Daniels (Leonardo DiCaprio) is a man going to Shutter Island with his friend Chuck (Mark Ruffalo) to go and investigate the disappearance of patient Rachel Solando (Emily Mortimer). Shutter Island is the home for the criminally insane, which has some crazy happenings, and Teddy becomes involved in this world and what he finds is something he could never believe. I must admit, I was somewhat disappointed with the movie in the first half an hour. I found it dragged on and was quite boring, but that half an hour was crucial to the movie so it couldn't have been cut. It doesn't work well as a horror, and will be most likely remembered as a smart psychological thriller. This is by no means Marty's best work, likewise Leo's. But, in saying that, they have both produced some bloody good films, and this film can't quite reach their high calibre. Shutter Island is creepy, and has some gasp-shock-horror moments. Towards the end of the movie, it redeems itself and becomes the stuff of nightmares. If you get a little bored/confused, please stick with the movie, because it is superbly crafted and you will love it. It's surprising that this film got a delayed release date which was closer to the Oscars, but didn't get any reognition. Michelle Williams at least deserved a Best Supporting Actress nod and the Cinematography could have been included. Looking for a smart psychological thriller? Look no further than Shutter Island.